Coca Cola has been lobbying against plans for a new bottle collection scheme in Scotland designed to reduce plastic waste, according to an Unearthed investigation. A leaked internal document from the firm reveals the company prioritised a “fight back” against EU moves to introduce deposit return schemes (DRS). The schemes are designed to encourage consumers to return their drinks bottles by adding a small refundable charge at sale. The DRS system has been shown to raise collection rates in Germany, Sweden and Denmark and is now being considered by other countries including Scotland. But major drinks companies, including Coca Cola, are pushing back against the plans, arguing it could negatively impact their business. Beyond the leaked plans, Unearthed has found evidence that Coca Cola has been lobbying Scottish politicians against DRS for years. The company also spent close to one million euros lobbying the EU commission, and met several times with politicians in Westminster. Richard Lochhead was the Scottish Minister responsible for exploring DRS until May 2016. He confirmed to Unearthed that he had been approached by Coca Cola and other industry representatives several times. “If we don’t introduce a deposit and return scheme in Scotland in the coming years and attach a value to items that are too often just thrown away, we’ll be missing out on all the benefits and too many valuable cans and bottles will continue to be a blight on our environment both on land and on our shores and in our waters,” he added. A Coca-Cola spokesperson said: “Our packaging is not only valuable, but is also essential for our business and vital for people to be able to enjoy our drinks. Any changes to policy around it are therefore important to us and so no one should be surprised that we closely follow these discussions. As many as 16 million plastic bottles go unrecycled in the UK every day. The average household recycles just 270 of the 480 plastic bottles they use a year, according to campaign group Recycle Now. 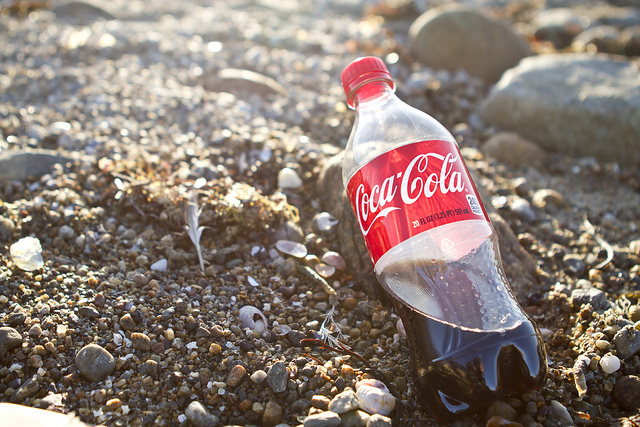 Many of those bottles that are not recycled can end up littering beaches and polluting the seas. DRS involves adding a small deposit to plastic bottles at sale, which is returned once the bottles are returned to collection points. In Germany, the introduction of a DRS led to 98.5% of refillable bottles being returned by consumers, according to Zero Waste Europe. The scheme has been likened to the plastic bag charge which reportedly caused bag usage to drop dramatically across the UK. However, drinks companies have been less than enthusiastic about the prospect of a DRS in Scotland. The leaked internal report from Coca Cola Europe includes a risk matrix which outlines possible EU policies that could impact the company’s business. Circled by the label “Fight back” is a point marked “EU scheme for deposit system”. The same document, and others leaked in the tranche, also revealed the company’s intention to push back against a proposed sugar tax amongst other initiatives. Coca Cola is part of industry group Packaging Recycling Group Scotland (PRGS). In January 2014 that group – including the Coca Cola’s Managing Director – met with then-Secretary of Rural Affairs Richard Lochhead to discuss the DRS plans. In that meeting was Simon Baldry, Managing Director of Coca-Cola Enterprises. Almost exactly a year later the Coke’s VP of Public Affairs met again with Lochhead, accompanied by representatives from PRGS. “PRGS will be seeking to force our hand on deposit return – and will be looking to leave the meeting with a commitment that it will be taken off the table as an option for consideration for the foreseeable future”. As spokesperson from PRGS said: “PRGS represents a broad range of businesses whose customers could be impacted by the introduction of a deposit return scheme. The formulation of good policy requires government to hear the views of all parties and assess those views in relation to its policy objectives. The government has consulted charities, NGOs and business while considering the potential of a deposit return scheme. In common with others, PRGS has been happy to set out the issues and consequences we believe would arise”. The lobby group tried setting up meetings with other politicians, including John Swinney Fergus Ewing and Marco Biagi. But in each case they were told it was only appropriate to meet with Lochhead. Coca Cola then changed their target. A visit by SNP leader Nicola Sturgeon to a Coca Cola bottling plant in East Kilbride in July 2015, provided another opportunity for lobbying. In a follow-up letter from PRGS to Sturgeon’s office, uncovered by The Ferret, the lobbying group notes that the issue of DRS was brought up during Sturgeon’s visit to the Coca Cola factory. Coca Cola has also been talking to ministers in Westminster. Records show that in January 2016 they met with Department for Environment, Food and Rural Affairs representative George Eustice to discuss “the food and drink sector”. Then in March 2016 Coca Cola and many other companies met with Rory Stewart, who was then DEFRA’s Parliamentary Under Secretary of State, to talk about the “circular economy” which involves companies taking responsibility for waste products. Minutes for these meetings were not made available. A Coca Cola spokesperson said: “We hold regular meetings with NGOs to update them on our progress towards delivering our current ambitions to boost the sustainability of our packaging and seek their advice on where we could improve things in future. Only last week, we organised a round table with 15 expert organisations and campaign groups, including Greenpeace, to ask them what more they thought we should be doing to help improve packaging recovery and recycling in the UK. Clarissa Morawski, Managing Director of Reloop, said: “The tactics used around the world by big business opponents of deposit systems are very familiar by now. They are always determined not to take responsibility for the litter the current approach generates, but they cloak this in concern for small businesses and local taxpayers, despite the evidence that both do very well out of such systems. In an published consultation on the Scottish deposit return scheme, Coca Cola argued against the idea of DRS. They warned that “no cost-benefit analysis has been undertaken” and that “Consumers don’t want it”. They also note: “Scottish businesses, such as ours, will be negatively impacted”. In fact the concept of a deposit return scheme appears to be popular in Scotland. A Greenpeace survey, under taken by Survation, of a sample group of more than 1,000 people found that more than three quarters said they would support a deposit return system in Scotland. A different survey by Sky News found that across the UK, 60% of respondents support DRS. Instead the company’s financial reports reveal that it was seriously concerned that DRS could impact its profits. In Coca Cola’s 2015 Annual Report to the Securities and Exchange Commission, the company notes: “Changes in laws and regulations relating to beverage containers and packaging could increase our costs and reduce demand for our products”. The latest EU commission transparency register shows Coca Cola spent more than 900,000 euros lobbying the commissioner in 2015. That work involved at least 11 Coca Cola employees. But the company also pushed for change through other groups. Nikolaus Tacke, Coca Cola EU’s Public Affairs Director, was appointed to the board of American Chamber of Commerce to the EU in March 2015. Unearthed has learnt that as recently as December 2016, Coca Cola representatives were still meeting with European Commission ministers, to push for change on recycling issues and to discuss deposit return schemes. Environmental campaigners argue the lobbying is unlikely to prove successful. While Reloop’s Morawski noted that Coca Cola and other companies had put up similar resistance in other countries only to change message when schemes were implemented. “[After implementation] Coca Cola and others often magically find it’s not a problem for them, or even that this approach helps them meet their environmental targets. I sense we might not be far off that moment across the UK,” she said.